Back in August at a family reunion a young cousin mentioned that she had broken, at one time or another, 23 bones. “I’ve never broken anything,” I said. On Thursday I got taken down by an unruly dog and broke my wrist. The cast comes off tomorrow. Perhaps I should have knocked on wood. Before you roll your eyes at my superstitious twaddle, researchers at the University of Chicago have shown that knocking on wood works. You can read about their findings in today’s New York Times. 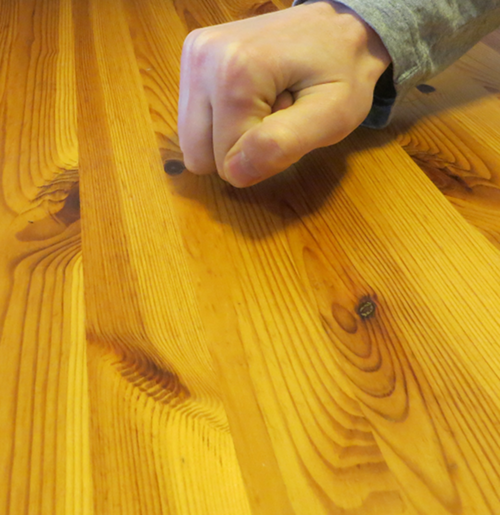 “Knocking on wood may not be magical, but superstition proved helpful in understanding why the ritual was effective. Across cultures, superstitions intended to reverse bad luck, like throwing salt or spitting, often share a common ingredient. In one way or another, they involve an avoidant action, one that exerts force away from oneself, as if pushing something away. So what would be a good embodiment of compassion? I’d like to suggest putting your hand on your heart. The word courage derives from the word heart in French — cour — and can remind us that compassion requires heart, requires courage. Try it — and let us know if it works for you. It should — knock on wood.